DisplayPort is a new license-free digital interface that is set to replace DVI and VGA completely in the future. It is capable of transmitting 10.8Gbps over a single cable. 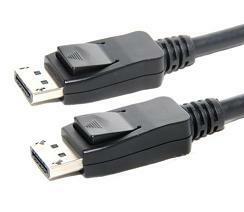 DisplayPort transmits audio and video signals from a PC to a display or a PC to a home theater system. A single cable can produce a resolution of 2560x1600. The technology adds the capability of being able to adapt to DVI and HDMI also. DisplayPort v1.1a delivers 10.8Gbps of bandwidth as a standard feature over a USB sized connector. In addition to greater resolution, DisplayPort also supports greater color depths and higher refresh rates. Color depth and refresh rate are becoming increasingly important in delivering stunning image quality with the latest display technologies for enjoying 3D games, high definition content, and professional applications.